AMD has received up to 20% of its total revenues from selling graphics cards used for Ethereum mining. Bitmain will put pressure on AMD, as the Chinese-based chipmaker is said to have developed its own ASIC, a graphics chip used for mining Ethereum, a Susquehanna analyst says. 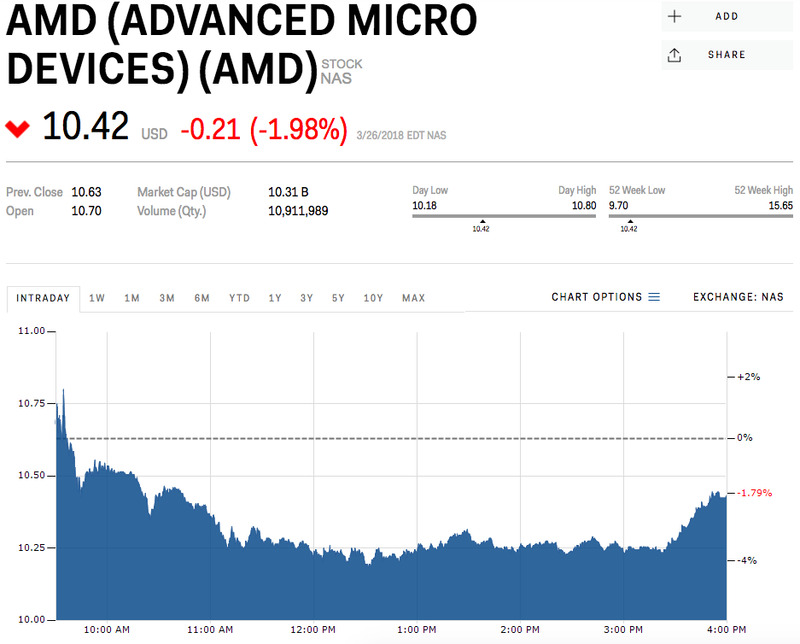 The analyst downgraded AMD’s shares and lowered its price target. You can view AMD’s stock price here. 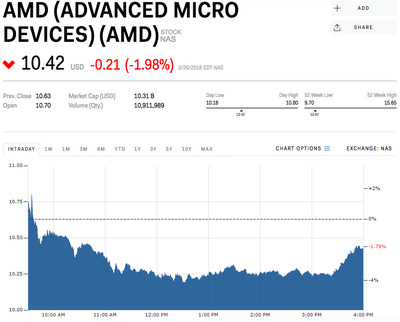 AMD‘s heyday as the chip of choice for Ethereum miners is about to come to an end, warns a Susquehanna analyst. 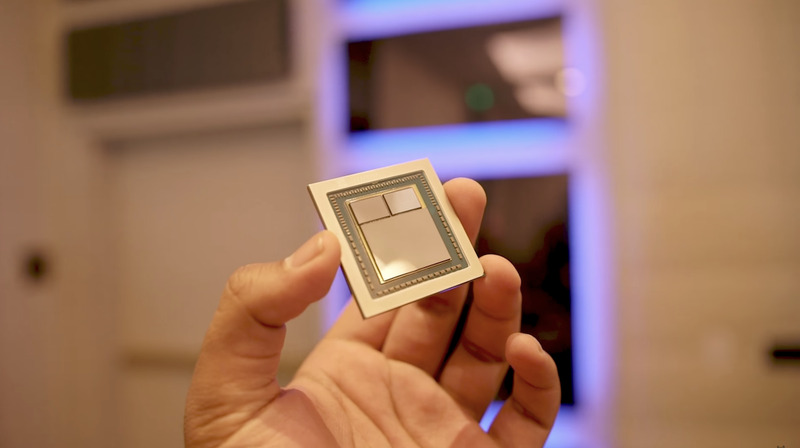 The advent of a new application specific integrated circuit (ASIC) – a graphics chip used to mine Ethereum – developed by Chinese-based chipmaker Bitmain spells trouble for AMD because the increased competition threatens its market share. “While this call is likely early (in front of needed GPU channel replenishment), the proliferation of Ethereum mining ASICs have the ability to impact ~20% of AMD’s total company revenue,” wrote Christopher Rolland, a Susquehanna analyst. AMD’s total revenue exposure to GPU sales makes it especially vulnerable to competition, Rolland notes. “While Bitmain is likely to be the largest ASIC vendor (currently 70-80% of Bitcoin mining ASICs) and the first to market with this product, we have learned of at least three other companies working on Ethereum ASICs, all at various stages of development,” Rolland said. Though the popularity and price of cryptocurrencies has fallen since their December highs, demand for graphics cards that help users mine Ethereum, bitcoin, and other digital currencies has risen, sparking a rise in prices for the sought-after chips, as well as shortages. Rolland still believes that AMD will have a “blow out” first quarter of 2018, bringing in $US500 million in revenues. However, he believes as new chips come into market, AMD will feel the pressure. He downgraded AMD shares to “Negative” and shifted his price target to $US7.50 per share from $US13. Though he did not change his rating on Nvidia, he did lower its price target to $US200 a share from $US215. Read more about how AMD and Nvidia are getting a boost from Hollywood.